In 2007 Paul and Brigette opened OPA! Coney & Grill in the Cherryland Mall in Traverse City, MI and over the years this great little Greek diner has grown up and transformed into OPA! Grill & Taproom. 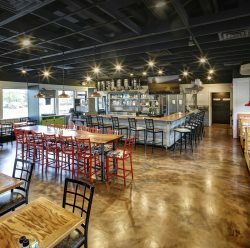 The new location opened in May 2018 in Crossing Circle and has afforded them the ability to expand customer seating, provide an interesting and updated bar atmosphere and more catering space in the kitchen. Featuring fresh and affordable Greek and Polish fare, and 50 different beers, it was designed to be comfortable and family friendly. Dorina added her flair with barn wood wainscot and fabricated shutters for the windows. The bar area has an industrial feel with cast iron pipe accents and powder coated furniture. Faux hide and buffalo check fabrics were used to reupholster the booths and seating, and the floor was brought to life with a custom epoxy. Exterior changes were purely creativity with paint and new signage.